Featured at this year’s Chicago African Summit & Resource Fair is a discussion on refugee and immigration issues affecting the African community. Discussions will cover refugee resettlement policy and issues currently facing refugees in the United States. Additional topics are the processes for green cards, travel for asylees, naturalization, and petitions for relatives both in the United States and abroad. Participants will have the opportunity to contribute to the discussion and ask their questions on immigration to our expert panelists. Refugees and immigrants face many hurdles to accessing healthcare. Many first generation immigrants ad refugees tend to recreate the way of life that existed back in their home countries. 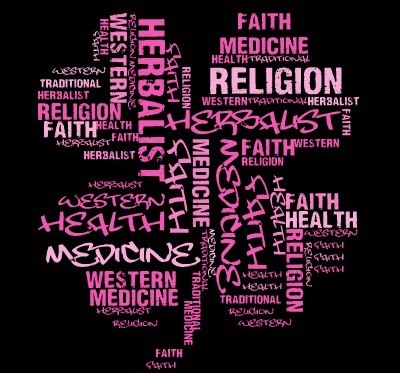 For most Africans, that means that seeing the doctor only when we get sick, use of traditional herbs and medications, and praying and hoping for faith healing. Besides these, many mental health issues are rooted in the stress associated with cultural adjustment, lack of legal status, fear of losing status, difficulty finding work-life balance, and dealing with past traumas. The Healthcare Panel at the 8th Chicago African Summit & Resource Fair features discussions on best practices for maintaining good health, preventive care, and steps that you can take to improve your health. Additional discussions will be around barriers to accessing health services and tools to overcome these obstacles. Free Hepatitis B and other health screenings will be available following the panel discussion. Register FREE for the Chicago African Summit & Resource Fair and join these interesting discussions led by Margaret Okodua,PhD and Yaw Peprah,MPH. Other panel discussions at the summit will be on refugee & immigration policy advocacy, community engagement, and US-Africa Policy. Additionally, the summit will include a Community Resource Fair that provides information about employment, immigration, legal services, housing, health screenings and other resources for participants. Travelling abroad as an Asylee or Refugee? Form I-131, Application for Travel Document is used to apply for a Refugee Travel Document. But who needs a Refugee Travel Document? An Asylum Applicant (an individual who has applied for asylum, but whose application is still pending) must first obtain advance parole before leaving the United States. If they leave the United States without first obtaining advance parole, they will be presumed to have abandoned their asylum application. The advance parole does not guarantee that the asylum applicant will be able to re-enter the United States; they will still have to be inspected by an immigration inspector at the border. An Asylee (an individual who has been granted asylum) may not travel abroad without prior approval. This special authorization is given through a Refugee Travel Document which is issued to an asylee in order to re-enter to the United States. If you hold refugee or asylee status and are not a permanent resident yet, you must have a Refugee Travel Document in order to return to the United States. An asylee who does not obtain a Refugee Travel Document before leaving the country will be unable to re-enter to the United States and may be placed in removal proceedings. A Derivative Asylee (an individual who obtained status based on a family member having been granted asylum) should also obtain a Refugee Travel Document before traveling abroad. Like advance parole, the Refugee Travel Document does not guarantee re-entry into the United States; the asylee will still have to be inspected by an immigration inspector at the border. A Lawful Permanent Resident (aka a green card holder) who obtained their status based on asylum may also travel abroad with a Refugee Travel Document. If they travel abroad without previously obtaining a Refugee Travel Document, they may also be unable re-enter the United States. Traveling abroad for asylum applicants, asylees and even lawful permanent resident who obtained their status based on asylum is complex and can have serious consequences. If you have any questions regarding this matter or any other immigration related questions, please feel free to contact our staff attorney Sondra Furcajg at (312) 949-9980. UAO Citizenship & Immigration Coordinator Sondra Furcajg was a perfect fit. A native French speaker, experienced human rights volunteer in Africa and licensed attorney all in one, Furcajg has worked hard over the past year to improve and expand the citizenship program and legal services offered by UAO. When Furcajg began in February of 2013, UAO did not provide any legal services outside of the monthly Free Citizenship Workshop. However, in response to increased demand from the Illinois African community, Furcajg had an innovative solution. “We started getting all these calls for other types of legal services. The response before I came on board was to refer these clients out to another organization. But then I said wait a minute, a lot of [our clients] speak French and could benefit from a French-speaking attorney advocating on their behalf. So I started taking these cases,” she said. A holder of both French and American citizenship, Furcajg has lived in Chicago for the past four years. 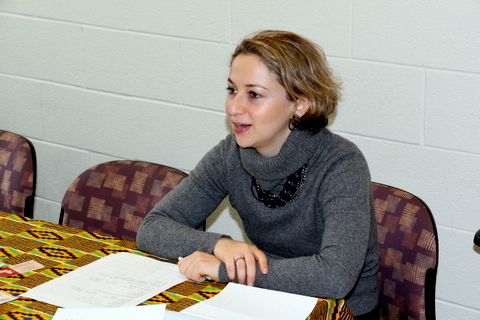 Before joining UAO in 2013, she volunteered at a refugee camp in Ghana. She also spent a year in Tanzania working for the International Criminal Tribunal for Rwanda. 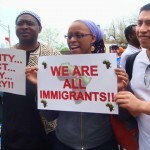 For Furcajg, the security and permanency of citizenship are among the most compelling reasons for African immigrants and refugees to apply for naturalization. “When you have your green card, things can happen where it can get revoked. Citizenship is permanent. There is a sense of security for you and your children,” she said. Despite the many successes since Furcajg’s arrival at UAO, outreach still remains the greatest obstacle facing the citizenship program and legal services. “If more people knew about our services, they would come to us first. Maybe we can help them. Maybe we refer them. At UAO, our clients always receive quality service and the right information,” she said. The next Free Citizenship Workshop will take place at Truman College on Saturday, April 26th from 9 am until 11 am. If you or anyone you know is interested in UAO’s legal or citizenship services, please contact Sondra Furcajg at 312-949-9980. Outreach efforts for the 2014 African Youth Forum are well under way. Over the past two months, United African Organization (UAO) staff members and volunteers have been working tirelessly to reach out to students and young professionals across the Chicago area and raise awareness about the upcoming forum. The forum—which will take place on March 29th from 11am until 4pm on the Illinois Institute of Technology campus—brings together both African and African-American youth to engage interactively with a wide array of issues. This year’s topics include immigration, youth violence and incarceration and education. The goal of the forum is to foster youth dialogue on these issues and develop a collective plan of action to overcome them. 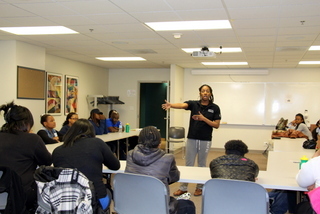 On March 13th, UAO staff members visited with the Truman College Africans and Friends Student Club (AFSC) to discuss the forum and recruit potential volunteers and participants. 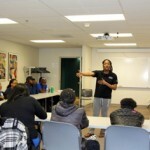 This was UAO’s second visit to Truman College to talk about the forum and its third visit in the past four weeks. In February, UAO Executive Director Alie Kabba also joined the AFSC as a panel speaker for their 2014 “Africa on Display” event. Thanks to the warm reception UAO received from AFSC President Emmanuel Acheampong, its most recent visit to Truman College was a success in galvanizing student support for the forum and resulted in the AFSC offering to set up informational displays on various African countries at the forum. 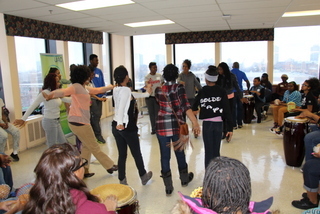 UAO’s continued partnership with the Truman College AFSC demonstrates its commitment to collaborating with youth groups and increasing awareness in the Chicago African immigrant community about its events, programs and services. If you or anyone know would like to join UAO at the African Youth Forum as a participant or a volunteer, please RSVP online or call at (312) 949-9980. More detailed information about the forum can found on by clicking here. Share information about the African Youth Forum on Facebook, Email, Tweet #AfricanYouthForum. Only U.S. citizen over the age of 21 years old may petition for their parents (mother and father) to live in the United States as lawful permanent residents (green card holders). legitimated before your 18th birthday. Immediate relatives of U.S. citizens do not need to wait in line for a visa, because visa numbers are always available to them. Immediate relatives who are in the U.S. may be able to file Form I-485, Application to Register Permanent Residence or Adjust Status and Form I-130 at the same time. If you are a U.S. citizen over the age of 21 and your mother or father is outside the U.S., you will file the Form I-130 along with the supporting documents with USCIS. If it’s approved, your mother or father will complete the visa process at the local U.S. Consulate in their home country. If you are a U.S. citizen over the age of 21 and your mother or father is in the U.S., they may be able to file Form I-485 and I-130 at the same time. Please contact UAO’s staff attorney, Sondra Furcajg, for more information at (312) 949-9980. UAO’s Health Care Coverage Enrollment Program is off and running. In the month of January, UAO succeeded in signing up over sixty individuals for health care coverage. 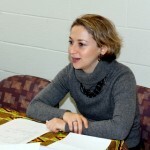 UAO staff member Lauren Herzog is the coordinator for the Health Care Coverage Enrollment Program. Over the past few months, she has worked to increase awareness in the African community about the new health care law and also planned free health care enrollment events around Chicago. The January 23rd event, which took place at Gold Coast Taxi’s offices in Uptown, enrolled over thirty Ghanaian taxi drivers and their families in health care coverage. 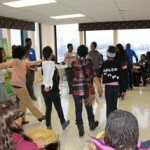 The workshop was such a success that Gold Coast Taxi and Herzog collaborated on a second enrollment event in February. Participants at UAO’s enrollment events are guided through the health care coverage application process by an In-Person Counselor (IPC). IPCs undergo rigorous state and federal training and are experts on the new health care law. “IPCs are fully trained to understand the Medicaid system and the Affordable Care Act. If you have any questions, they can answer them. That way you end up with a plan you fully understand,” Herzog said. Although enrollment numbers have been strong thus far, they are expected to increase as the March 31st deadline for health care coverage draws nearer. Herzog anticipates future backlogs in the system—especially if you are applying for Medicaid—and encourages all those planning on attending an enrollment event to do so soon. “At this point, most people think March 31st is way off. However, that deadline is much closer than it might seem,” Herzog said. UAO will hold more enrollment events in the month of March. Please visit our website for more detailed information. Participants need to bring with them photo identification, a social security card, income information and immigration information. The enrollment events are free and open to the public.